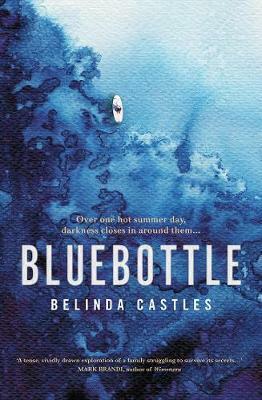 Set on Sydney’s Barrenjoey peninsula, the sea is a constant presence throughout Belinda Castles’ Bluebottle. From the cliff-top shack where architect Charlie Bright and his photogenic family spend Christmas 1994, it is always visible or in earshot, with a promise of pleasure. Through this glare of natural beauty, the narrative unfolds obliquely – slipping between the past and present and the points of view of the three Bright offspring, Louisa, Jack and Phoebe. It is their father, Charlie – charming and charismatic with his wild plans for their house – who is their focus. Charlie demands everyone’s attention with his brilliance and talent, but hints of instability create uneasiness in all his children. This unease grows as Charlie’s preoccupation with a missing teenage girl from their neighbourhood starts to border on obsession. Even Tricia, his long-suffering wife, cannot curtail it. On Boxing Day 1994, all three children, in different ways, come to uncomfortable conclusions about their family. Twenty years on they still live on the peninsula but nothing is spoken out loud and the house on the cliff-top is no longer theirs. Charlie is gone from their lives – and then the mystery of the missing girl resurfaces. Bluebottle is not a conventional thriller but there is an escalating degree of suspense. The Bright siblings, from the position of vulnerable adolescents, inadvertently create sidetracks and half-truths from the mysteries of their parents’ lives, while Charlie’s volatility and increasing unpredictability puts tension into every encounter. All of this is set in contrast to the idyllic sense of the place Castles creates – an enclave of privilege surrounded by sunlit beaches and sparkling waterways.